I thought I'd share this brochure with you, while promoting the department I graduated from at Biola University. 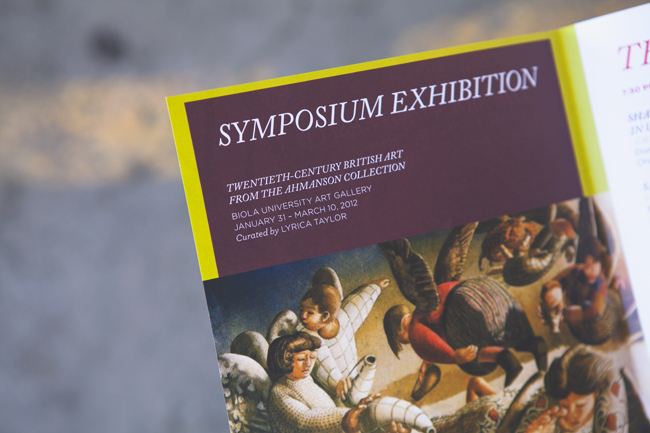 This brochure is for their annual Arts Symposium which is held every spring -- and is FREE. This year the topic is Sacred Space and the visionary-in-residence is Roberta Ahmanson. I enjoyed redesigning this brochure and switching up the layout from the previous year. It's nothing fancy print-wise, but the lines of color and elegant type while working with the different artists' imagery was a fun challenge.